Elis and I were delighted to accept an invitation from Erik Hirschfeld for dinner at his home in Malmo on the eve of the show. As we have crossed the north of the European continent travelling from country to country we have had to pay close attention to and adapt to the local rules of the road. Some traffic regulations are harder to comply to than others! Leaving our friends' house in Denmark we headed towards Sweden and crossed the enormous bridge that links the cities of Copenhagen in Denmark and Malmo in Sweden. From there we headed directly to the bird show-ground and established our location, met the organisers and oversaw the raising of the Union Jack! After this we returned to Malmo and Erik's flat to prepare for dinner. View across to Copenhagen fro Eik's flat in Malmo. Erik is a superb chef it turns out and we had a very enjoyable evening in some very distinguished company. Those present apart from Erik, Elis and myself were Lars Jonsson, who needs no introduction, and his charming wife Ragnhild, our old friend David Lindo aka The Urban Birder, Gorka Gorospe a Spanish artist and Vanesa Palacio who represents birding in Extarmadura, Spain, Per Undeland a prominant Swedish birder, Niklas Aronsson the Editor in Chief at Sveriges Ornitologiska Forening and Nils-Arvid Andersson the organiser of the Falsterbo Bird Show. The discussion covered all manner of topics with a bird theme, from conservation to twitching. With such a wide range of experience the discussion was bound to be lively and interesting, and it certainly was; here is the 'team photo' that was taken by Erik's son. 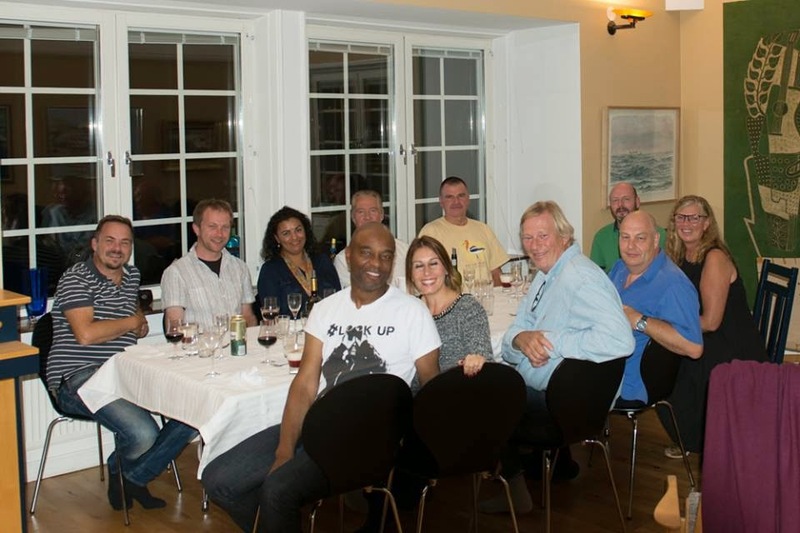 L-R front: David Lindo, Vanesa Palacio, Lars Jonsson, Rick, Ragnhild. Elis discovered yesterday that she had left her bins at our friends' house in Denmark, luckily Robert Lager from Swift Optics came to the rescue and lent her a pair of 'Warbler' 10x40s for the weekend, good man. Just as well he did otherwise she'd have missed the White-tailed Eagle flying over the show-ground today. The weather was kind although the wind got up a little and blew all our display boards over. They were soon fixed with a brick behind each! Our stand at the Falsterbo Bird Show. Predictably the numbers of people attending was not high as it was Friday, but the steady flow of people kept us busy enough for the day to pass very quickly. The view from outside our stand to the left. We spent a lot of time explaining who we were and what we do. The concept of charity, we were told, in Sweden, is not well developed. In the past the government has used taxes to fund good causes meaning that everyday citizens are not expected to contribute in this way. Although the amount of government input has been reduced in recent years, the citizen input has not increased meaning that fundraising in Sweden is no easy task. The view in front of our stand. However, if you have something to sell that people want to buy, that is another matter. Earrings and fridge magnets were the most popular items today followed by postcards. Our neighbours at the show just happen to be Eric and Lars. Eric has generously donated a signed copy of The World's Rarest Birds as a raffle prize and Lars is selling posters, like this one. Superb wader poster by Lars Jonsson. We are looking forward to tomorrow when we will give a talk at 15.40 and hope to do even better than today. Couldn't resist including this photo of Lars and Elis, talk about the long and the short of it!